Simon & Schuster/Paula Wiseman Books, 9781481449311, 32pp. In his first outing, Bitty Bot was right in his element—tinkering around with a spaceship and blasting off. But he’s not happy being on the beach at Botco Bay. McCanna reprises his playful, punchy rhymes: “Sun’s too hot and sand’s too gritty. Let’s go back to Robot City,” Bitty laments. Then Bitty—who has a head shaped like a tablet, long and stripy arms, and rolls on two big wheels—meets two robots who are similarly unenthusiastic. They build a submarine from a hodgepodge of materials, including a bench, pliers, soda cans, and “a drainpipe for a periscope,” and take it on an underwater adventure that leads them to a mermaid town. Carpenter fills his playful spreads with jewel tones and expressive robots with clanky, old-fashioned charisma. 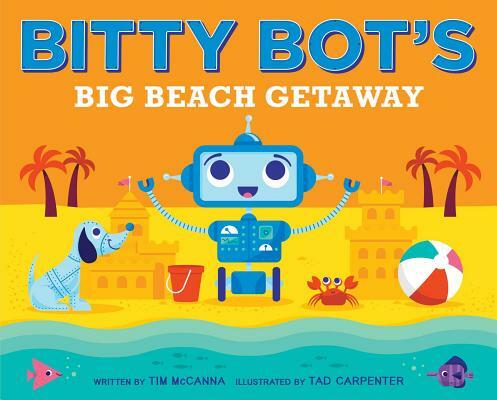 While most kids enjoy a day at the beach, McCanna offers a generally relatable message about how companionship in tandem with imagination can help make any day better.